Details : 25" SEv. Tet. E-M. Re. Hyb. Bloom 6"
A dramatic ivory cream bloom with a bold black-purple eye and a pronounced matching bubbly edge. Great parent for large eyes. Popular. Details : 27" Ev. Tet. E-M. Re. Bl 4.5"
Scarlet red with lacey braided white gold edges, lighter sepals edged in red. Flat blooms, very showy and fertile. Limited stock - 1 per customer. Details : Ht 26" TET. EV. E. Re. Bl 6"
Cream with a butterfly pattern multicolored eye above a green throat. Details : Ht 34" TET. S.Ev Mid. Re. Bl 6"
Saturated purple with a large silver watermark and matching edge. Limited stock - 1 per customer. Smooth deep rich pink with a gold green throat. One of the best pink flowers. Wide petals with good ruffling. Many buds. Popular. Limited stock. Details : Ht 24" TET. Ev. E Re. Bl 6"
Almond pink with a red eye and ruffled red edge. Deep green throat. Lovely form. Just beautiful! Polychrome pink and cream, chartreuse edge above green throat; heavy substance. A quality bloom. Shane Green - Exclusive to R.B.D & Irises. Rich dusty rose-raspberry blooms with a dramatic black burgundy eye and matching edge. 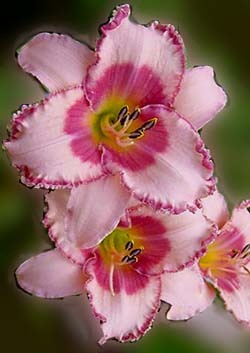 Blooms are rounded, ruffled with slight crepeing of great substance. Vigourous and hardy. Details : Ht 28" TET. Mid. Re. Bl 5.5"
Lovely antique pink with a deep burgundy crimson eye and a gorgeous green throat. 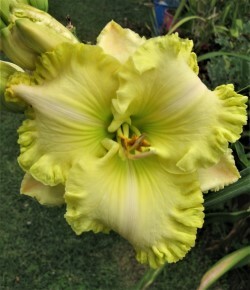 Shelli's Green Glory - Exclusive to R.B.D & I. Details : Ht 24" Dorm. TET. M-L Re. 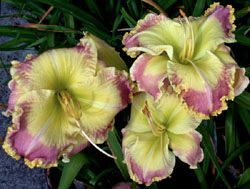 Bl 6.5"
Lavender pink with a huge centre of cream to lime green throat with a cream-gold ruffled edge. Spectacular. This was a seedling from top American Hybridiser "Guy Pierce" when he lived in Australia. Another image in "Shelli's Intro's". Details : Ht 25"TET. Ev. E-M Re. Bl 6½"
A large cream yellow rimmed with a thick gold fringe edge. Green throat. High bud count. Limited stock - 1 per customer. Details : 22" Ev. Tet. E. Re. Bl.5"
Pretty pale pink with a light rose eyezone above a large yellow/green throat. 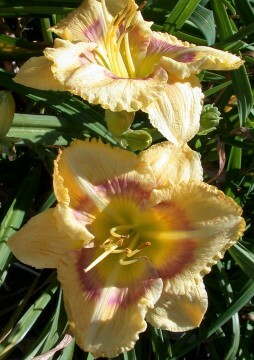 Petals are wide and have a ruffled and pleated gold edge. Limited stock. Details : Ht 25" TET. DORM. E-M Re. 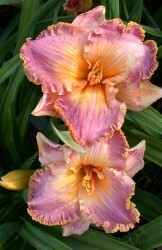 Bl 5.5"
Superb bright rose pink with large yellow ruffled edges. Limited stock - 1 per customer. Details : 23" SEv. Tet. E-M Re. Bl. 6"
Large striking orange with maroon eye. Heaps of blooms. A real garden show-off. Great in front of or next to Agapanthas. A favourite orange. Limited stock - 1 per customer. Details : Ht 28" TET. Ev E-M - Bl 7"
Details : 24" Ev. Tet. E-M Re. Bl 5"
Lovely blooms of deep rose . Limited supplies. Details : Ht 35" TET. Ev. E. Re. Bl 5.25"
Plum lavender with a huge blue eye. Green throat. Limited stock - 1 per customer. Details : Ht 24" TET. Ev. E-M Re. Bl 4"
A small flowering pink with raspberry eye & edges. Picotee petal edges of raspberry trimmed with hooks of white & gold. Rounded tidy blooms. Prolific. Details : Ht 22' DIP. Ev. E Re Bl 6"
Ruffled melon, peach pink blend above a green throat. Rounded & of flat form. Details : 26" SEv. Tet. M Re. Bl 4.25"
Smallish blooms but not a mini of pale pink with a light pink watermark surrounding a green throat. Bright bubbly gold edge. Blooms displayed on rather tall scapes. Limited Stock - 1 per customer. Details : 23" Ev. Dip E. RE. Bl 9"
Large ruffled chartreuse self with a green heart. A deep rose-pink with a very large bright dark raspberry eye and a small lime throat. Recurved blooms. Gorgeous colours. Limited stock - 1 per customer. Details : 30" Ev. Dip. M. Re. Bloom 6"
Large ruffled royal purple blooms with a small green throat. Limited stock. Details : Ht:28" Tet. SEv. E-Mid. Re. Bl 5"
Ivory cream pink self with distinct ruffled gold edge and lime green throat. Limited stock - 1 per customer. Details : 30" Ev. Dip. M-L. Re. 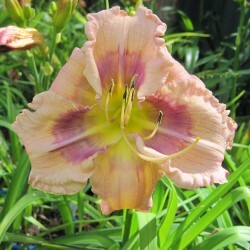 Bloom 6"
Soft tangerine sherbert pink with a lovely big, round, deep rose-pink eye. Attractive. Details : 25" SEv. Tet. E Re. Bl 5"
Peach pink blend completely surrounded by large heavy looping ruffles and continue down into the throat. Details : Ht 24" TET. SEv. E-M Re. Bl 5½"
Rich cranberry blooms with a sparkling metalic gold edge. Full, round form of heavy substance. Holds well in the sun. Vigorous. Limited stock. Details : 22" SEv. Tet. E-M Re. Bl 6"
Details : 26" SEv. Tet. E-M Re. Bl 6"
Near white to cream with heavy ruffling and thick substance. Gorgeous ruffles. 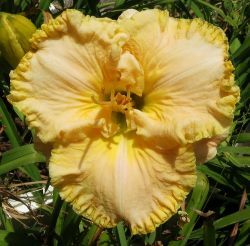 A quality daylily. Details : 29" Ev. Tet. E-M Re. Bl 6"
Large ruffled rounded blooms of baby pink apricot, green throat. Details : 25" Ev. Tet. E-M Hyb. Bloom 6"
A pinky lavender mauve blend with raised looping ruffles and a golden edge. Very fertile. Limited stock. Details : 24" SEv. Tet. E Re. Bl 6.5"
Near white with yellow green throat. Limited Stock - 1 per customer. Details : Ht 31" TET. Ev. E-Mid. Re. Bl 6.5"
Pink orange with a bold red eye and red and gold edge. Limited stock - 1 per customer. Details : Ht 23" TET. Ev. Re. Bl 6.5"
Large extravagantly ruffled pastel blooms with a pink overlay. Excellent substance. Opens early and easily. Details : 26" Ev. Tet. E-M. Hyb. Bloom 5.75"
A very round and ruffled pale pink bloom with a small rose eyezone above a deep green throat. The petals have a raised piecrust edge. Sprite In Flight - New! Exclusive to R.B.D & I. Details : Ht 22" TET. SEv. M Re. Bl 5.5"
A Bi-Colour. 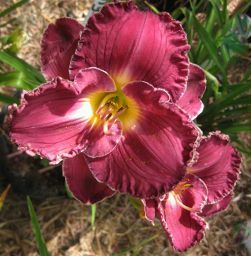 Petals are a deep crimson red with a large pale salmon/almond edge that gives the bpetals a triangular pattern of red. Pale salmon-almond sepals with a blush of pink band. A chartreuse throat. Details : Ht 28" TET. SEv. E-M. Re. Bl 5½"
Details : Ht 22" S.Ev - Dorm. TET. M Re. Bl 5.5"
Deep scarlet red blooms with a wide ivory edge on petals and sepals. Emerald throat. Stunning. Rich deep crimson burgundy rounded and ruffled blooms. Great substance. Lime throat. Details : Ht 26" TET. Ev. E-M Re. Bl 4.½"
Details : 28" SEv. Tet. M-L. Re. Bl 6"
Cream with a rose-red eyesone and ruffled rose edge. Bright red with almond edges and a green to yellow throat. Good performer. Details : Ht 26" ETE. E-M Ev. Re. Bl 5.5"
Ruffled blooms of lavender-pink with a large golden centre & matching ruffled edge. Take note this picture was taken late in the afternoon hense colouring of blooms. Details : 21" Ev. Tet. E. Re. Bl 4"
Peach with a rose pink eye and double edge of rose pink and gold. Very pretty. Details : 28" SEv. Tet. M. Re. Bl. 6"
Very dramatic bright salmon coral with a large triangular deep black eye and bold black edge. Throat is bright yellow green. Many blooms, well branched and vigorous. Pretty blooms of peach with rose eye and green throat. Ruffled and rounded. Limited stock - 1 per customer. Details : 21" Ev. Tet. M Re. Bl 5.5"
Satiny peach blooms with a small grey lavender halo. Charcoal lavender double edge. Limited stock.